Last year I upgraded from Boyfriend 5.0 to Husband 1.0 and have noticed a distinct slowdown in overall performance, particularly in the flower and jewelry applications, which operated flawlessly under Boyfriend 5.0. In addition, Husband 1.0 uninstalled many other valuable programs, such as Romance 9.5 and Personal Attention 6.5 and then installed undesirable programs such as NFL 5.0, NHL 4.3, MLB 3.0 and NBA 3.6. Conversation 8.0 no longer runs and Housecleaning 2.6 simply crashes the system. I’ve tried running Nagging 5.3 to fix these problems to no avail. What do I do? First keep in mind that Boyfriend 5.0 is an Entertainment Package while Husband 1.0 is an Operating System. Try to enter the command: “C:/ITHOUGHTYOULOVEDME” to download Tears 6.2 which should automatically install Guilt 3.0. If application works as designed, Husband 1.0 should then automatically run the applications Jewelry 2.0 and Flowers 3.5. Remember, though, that overuse of above application can cause Husband 1.0 to default to Grumpy Silence 2.5, Happy Hour 7.0, or Beer 6.1, Beer 6.1 is a very bad program that will create Snoring Loudly 10.8. Whatever you do: DO NOT install Mother in Law 1.0 or reinstall another Boyfriend program. These are not supported applications and will crash Husband 1.0. In summary Husband 1.0 is a great program, but does have limited memory and cannot learn new Applications quickly. Very funny. I laughed out loud. 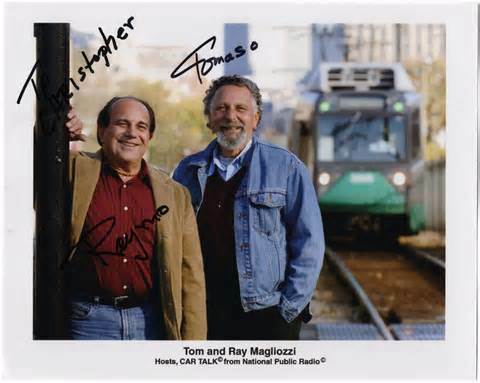 I used to love Car Talk when I lived in the US. I never thought to check, but they have podcasts, of course! Yep, a classic from Click and Clack! Thanks, it is an hour of laughter, and even thou they’re repeats they still great, If fact in those days I was still able to figure out to fix my own car. What a riot! Thanks for sharing such a hilarious story! I love listening to the NPR radio too, especially while driving.